No vineyard is specifically designed to produce this wine, but usually its core comes from vines of Pinot Gris planted between 1988 and 1992 in the Clos Windsbuhl of Hunawihr. In 2015, we also felt that Rotenberg and Heimbourg wines kept too much sweetness, so we decided to blend all of them together, searching for the best possible balance. 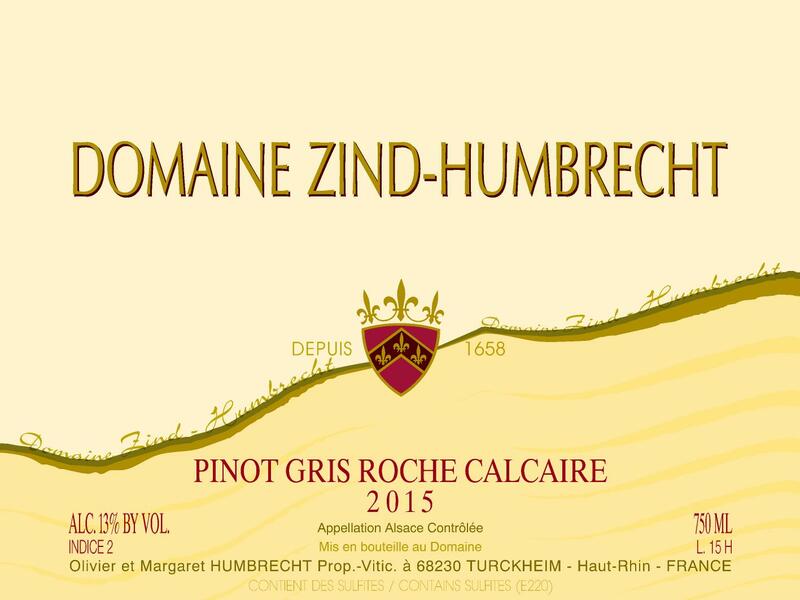 Pinot Gris is planted on many different soil types in Alsace, but even if there are some remarkable examples on volcanic, granite, sandstone, slate… I must admit that limestone soil is usually the most consistent geological formation for this grape. Pinot Gris ripens quickly and can reach high potential at harvest. Limestone has a cooling and structuring effect on the wines. Alcohol feels lighter, sweetness feels drier, the aromatics become more elegant and the wines gain complexity and ageing potential. All these elements are in place in this wine. 8/2017: yellow/gold young colour. The nose is very delicate and combines citrus fruit with light torrefaction and nutty aromatics. First impression is of relatively rich wine, but the palate contradicts the nose by revealing a delicately structured palate that has an elegant acidity and medium vibrant structure. The light residual sweetness is very discreet and really not the main focus of this wine. The limestone influence is so clear, especially from the Windsbuhl which was the main component of this wine. Definitely also worth keeping a few years.